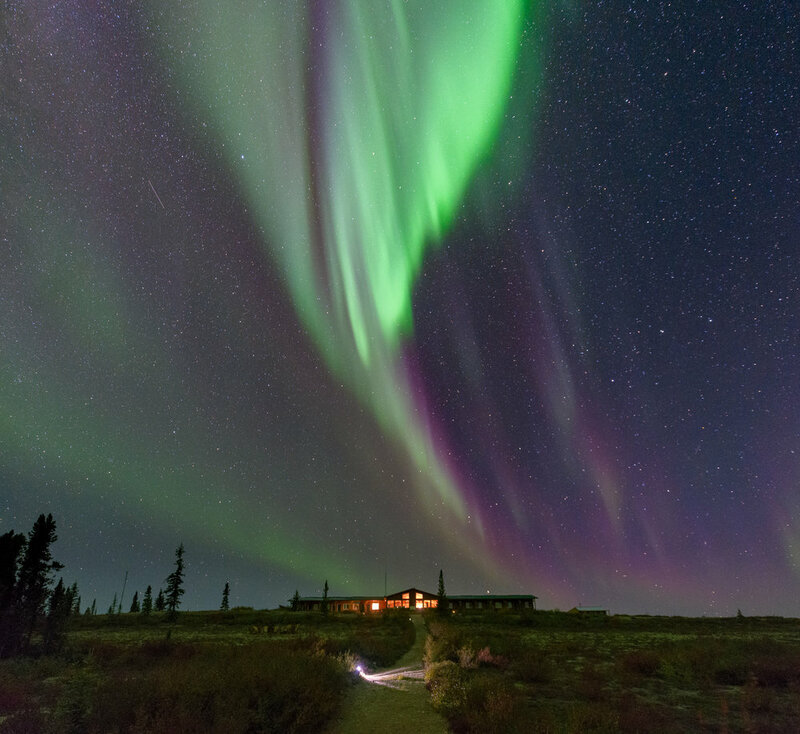 Join us in the remote wilderness of the Nunavut Territory of Canada to photograph the tundra’s autumn colors, northern lights and herds of Caribou migrating. The male Caribou will be moving through the endless wilderness on a path, following instincts formed from thousands of years, usually in herds of 5 to 20. This is the time of year they shed their velvet, making their large antlers even more spectacular. Muench Workshops pros Andy Wililams and Kevin Pepper, assisted by our amazing local guides who know the routes of the caribou, will lead you through the wilderness in search of the best wildlife sightings and light. We travel mostly by boat, and everyone gets a one day helicopter safari included. This is a chance to explore some of the remote areas just north of the lodge where the boreal forests transition into the arctic tundra. The heli-safari is an all day excursion with the pilot, guide and Andy or Kevin accompanied by 3 of the guests. Everyone will get the chance to spend time on foot with the wild animals during this excursion. The caribou walk along the eskers, following the trails they have been using since the last ice age. You too can walk these trails that are worn into the ground—unique paths that stretch for nearly 500 kilometres and can be seen from the air. 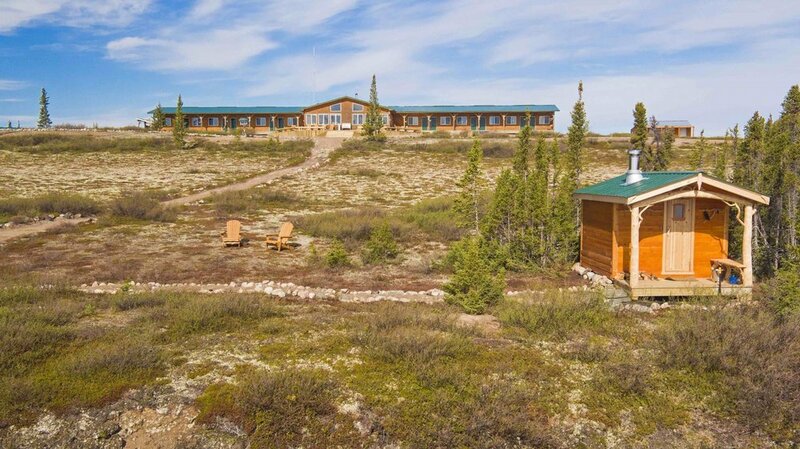 The lodge's surroundings are home to a unique history as the lakes and rivers were once inhabited by the Ahiarmiut—Farley Mowat’s “People of the Deer”—for nearly one thousand years. Numerous unspoiled historical sites dot the tundra, some of which we will visit and photograph by boat, and explore by foot. Each full day excursion is complemented by a gourmet meal that awaits guests upon arrival. Arctic Haven’s chef focuses on incorporating local flares into the evening dishes, including fresh arctic lake trout gravlax. The Arctic Haven wine list offers some of Canada’s best wines, paired to match the local dishes. 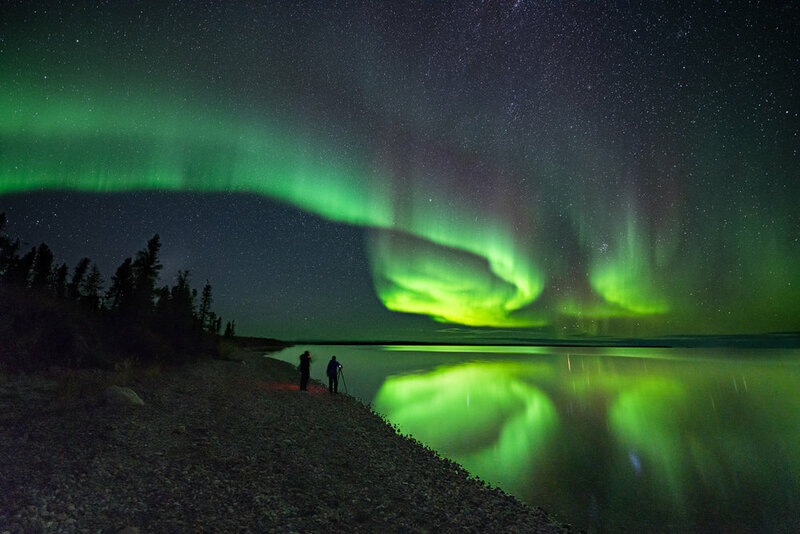 Evening presentations will cover interesting topics such as the mythology and folklore of the Aurora Borealis, local photography, and cuisine. Come join us in this amazing and remote wild lodge in the far reaches of the planet, at 60 degrees north. September 11, 2019: Arrive in Yellowknife, Northwest Territories (YZF airport code). There is a free shuttle from the hotel (up until midnight) or, take a 5 minute taxi from the airport to our hotel. We'll gather at 6:00 PM for a group dinner, and discuss the photo adventure ahead. September 12, 2019: Private charter to our lodge overlooking Ennadai lake. Don't worry, we've allowed for the weight of your camera gear on our private charter. At our lodge you'll have a spacious and comfortable room with private facilities and plenty of electric power for your cameras and other devices. The food is nothing short of amazing. Local fare, fresh ingredients and creative cooking styles. Homemade fresh breads and baked goods, fresh fish and meats, fruits, and vegetables. We'll spend the week at our lodge venturing out on our boats and on foot to photograph a variety of wildlife including the caribou. ducks, loons, tundra swans, sandhill cranes, snow geese and Canada geese, Arctic terns and eagles can be photographed and heard as they begin their migrations south. 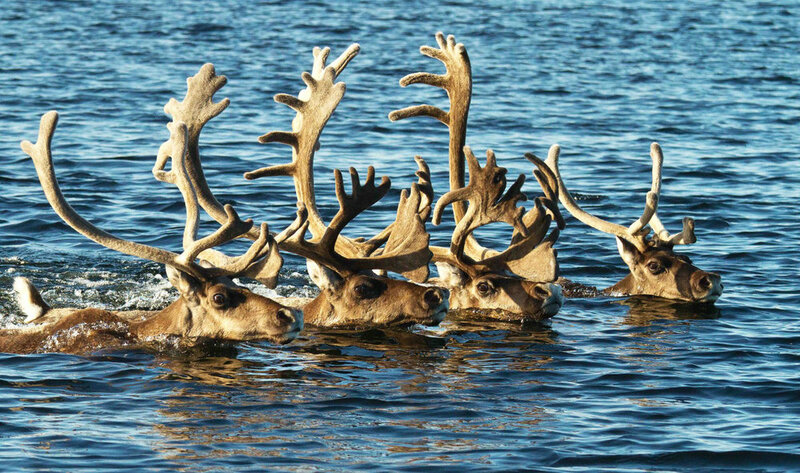 We'll visit naturally formed narrow sections of the lake where the caribou like to cross. In the evenings back in our lodge, we have a variety of presentations for you from local pro photographers, historians, cooking demonstrations, and more. Of course we'll be doing our famous image reviews and critiques, with plenty of post-processing instruction and tips. September 13, 2019: We will explore and photograph the northern reaches of Ennadai Lake. It is here above the tree line that caribou can be found on islands and shorelines. A gourmet lunch is served by your guides on the picturesque beach here on Paradise Island. The afternoon is spent cruising amongst the islands to spot caribou, with short walks on land to view them closer. Following an amazing dinner Andy and Kevin help you with your images as we hopefully wait for the skies to clear and come alive with the aurora. 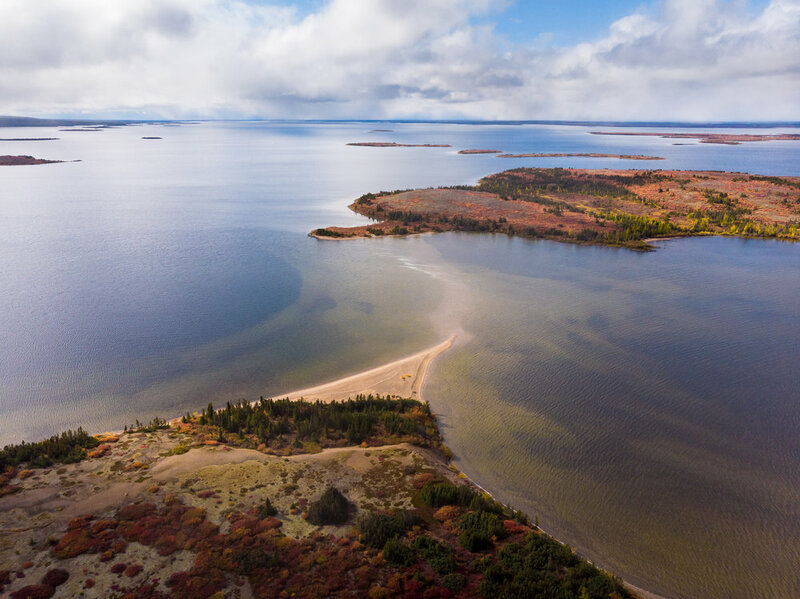 September 14, 2019: We begin with a short, 20-minute boat ride to arrive at the shoreline where our hike to the Blind Hill esker begins. 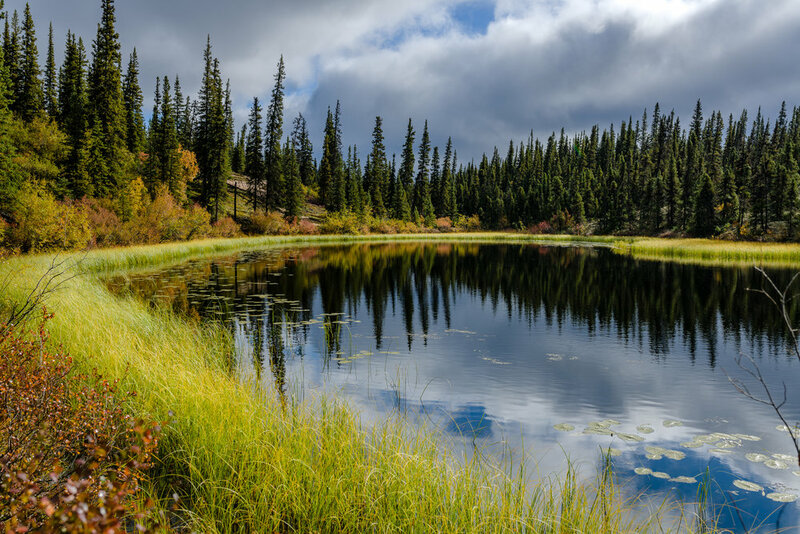 This hike takes you from the soft and wet blueberry flats to a dry and well-worn caribou trail on the spine of an esker, to an open tundra ridge overlooking the lakes and land below. As we make our way across the high ridge, lakes and rivers and tundra can be seen below, amongst the blanket of vibrant autumn colors. An alternative option to hiking today is fishing for trout and grayling at Richard’s shoal and Grayling Rapids. Both experienced and new fisherman are provided with equipment and accompanied by expert guides. For those not able or wanting to hike, there is plenty of other shooting which requires no hiking. 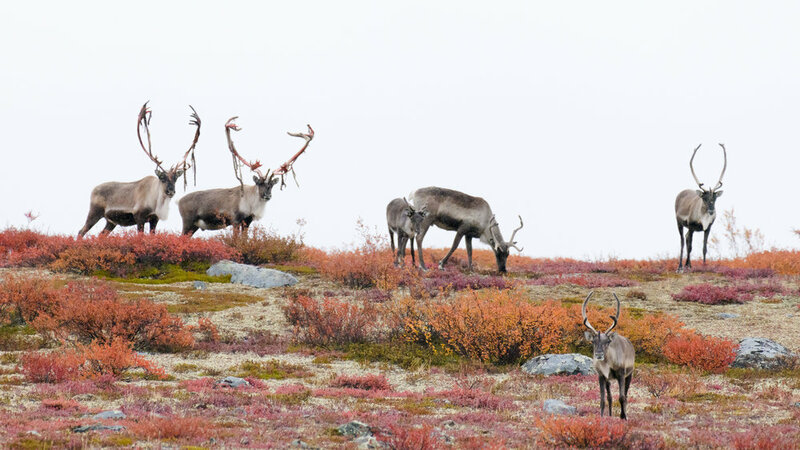 September 15, 2019: Today we board our boats and head to the North Arm exploring the far reaches of our lake where caribou are most frequently seen. 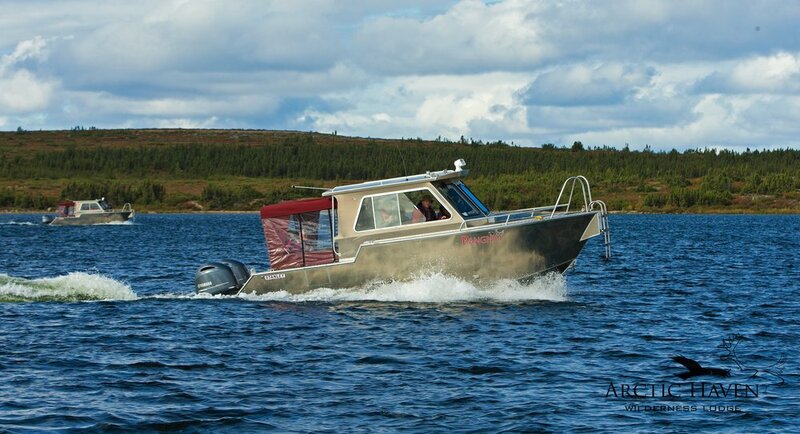 We cruise the shorelines, looking for caribou, either on land or swimming between the islands. The terrain is quite different from the rest of the lake; here the bedrock is exposed and round rocks have been placed on top by glaciers. We embark the boats yet again in search of more caribou, which if given the opportunity, we will try to stealthily approach from land to get a better view. September 16, 2019: Today we offer a range of activities, using our cabin outpost as a central hub. We board the boats for a 40 minute boat ride to Cabin Island, which we can explore before choosing an activity for the morning: kayaking amongst the islands or visits to archaeological and historic sites in the surrounding area. Back at Cabin Island after another morning of photography, a bonfire on the beach is ablaze throughout the day and a fish fry lunch will supplement our usual gourmet spread! September 17, 2019: We start with a short boat ride up the Kazan River—one of the largest rivers on the Barrens. 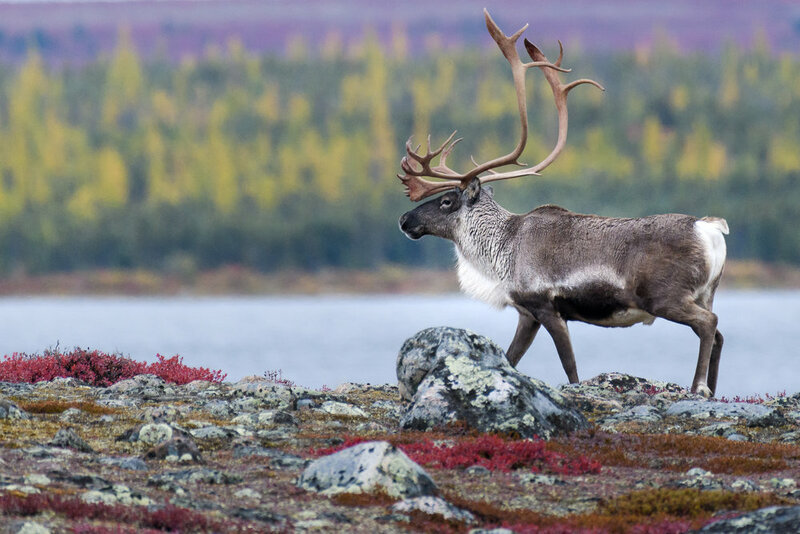 The tundra begins to turn into forest—birch, black spruce and tamarack trees adorned in full autumn colour lay claim to the territory, with caribou trails weaving amongst the sparse, yet impressive, arctic forest. Moose have been seen in this forested and marshy area as well. This location is also excellent for tundra swans that nest on the edge of the river bank, in small grassy openings. After lunch, the caribou and wolf watch continues as we travel the river and visit locations frequently used by the caribou herd at this time of year. 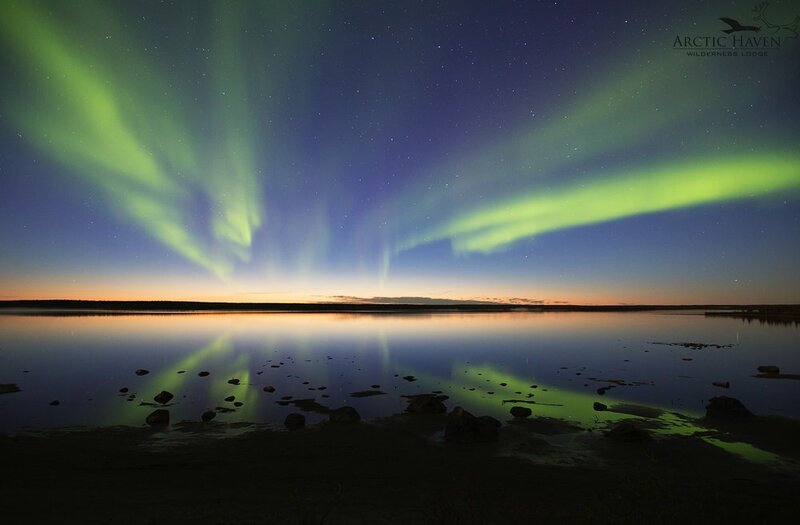 Today is the last opportunity to take in the northern lights! Cozy up in a blanket on the front deck Muskoka chairs and enjoy a glass of fine Canadian wine with your cameras ready as we hope for the lights to begin their show. September 18, 2019: This is your last day in the Barren Lands and you will be familiar with the area of Ennadai Lake and Lodge. Today we offer a ATV ride along the ridge of an esker to view many small ponds that make for great landscape photography opportunities. Wolf and caribou tracks can be followed in the sandy paths and beautiful shimmering ponds are seen through the black spruce forest. In the late afternoon, our plane will arrive to take us back to Yellowknife, where we have rooms reserved for you (your expense). Workshop concludes. We recommend you book departing flights out the next day as our chartered flight from the lodge is weather dependent and can be late. September 19, 2019: Flights home anytime this day. Air transportation to and from Yellowknife, Canada. Alcoholic beverages. Passport and visa fees, if any. Medical Evacuation Insurance (required). Travel Medical and Trip Cancellation Insurance (optional, but recommended). Alcoholic beverages. Lodging in Yellowknife on September 18, 2019. Anything not listed as included. Your deposit of $3,500 will hold your space in this workshop. A second payment of $3,500 is due by March 1, 2019. The balance of $3,995 will be due not later than June 1, 2019. All of our standard terms and conditions apply. Need special payment arrangements for your deposit? No problem, just ask us. It's a great opportunity to witness and photograph one of the great migrations on our planet. 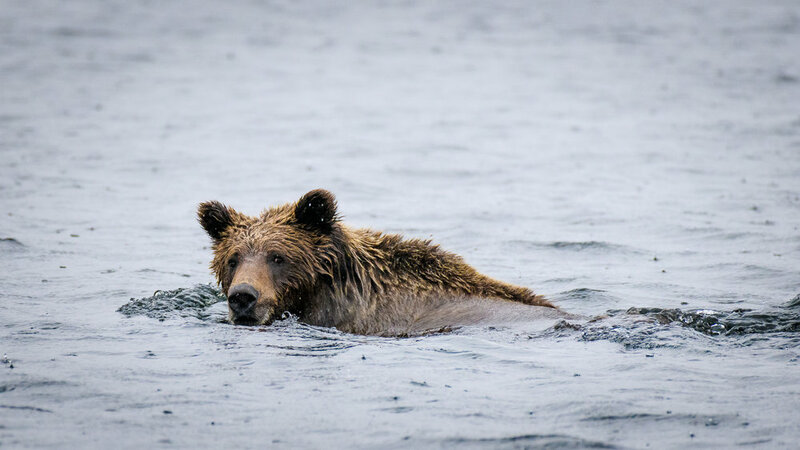 If you love wildlife and remote landscapes click the "Sign Me Up!" button now because this workshop will sell out fast. See you in Nunavut!